Keith Covey, NDDC Board Officer and former Mayor of Northfield, is our member of the Mayor’s Task Force on Downtown Streetscape Projects. There’ve been many questions about the projects scheduled for this year and we’ve been promising an update on our website. Here’s Keith’s comment to me: “Ross, I don’t know how you can summarize and blog this, but have at it.” Well Keith, I’m not going to try to summarize it, I’ll just blog it. It’s admittedly long, so read on, interested stakeholder, read on. 1. DECORATIVE PARKING LOT BUFFER RAILING (2007): The City will install a sample of proposed “standard” stone screen wall and railing to screen public parking lot at NE corner of 3rd St. and Hwy 3 (pictured). This will also be a location for one of the way-finding signage units. The committee strongly recommended that the wall be real limestone on both sides, not concrete block on the “back,” because there is essentially no “back” at this site. 2. 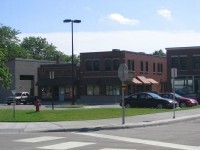 5TH AND WATER TO BRIDGE SQUARE (2008): The redesign concept has been approved by the council, but everyone recognizes that compromise will be needed because of cost. Construction is scheduled for 2008, coordinated with 5th street rebuild from Water to Washington. At the committee’s urging, staff and consultants agreed to bring to next meeting a broad-brush cost breakdown comparing major elements of this project with a Washington Street parking deck, so we can evaluate the cost and value of each piece and consider what to keep, what to cut and what to postpone to a later phase. 3. WAYFINDING (2007 & 2008): Design looks good. Locations: 5 signs on Hwy 3 at 5th, 3rd and 2nd, scaled to be readable from a moving car; 7 on downtown corners at pedestrian scale. There will be undesignated panels that maybe used to promote businesses. A full scale mock-up will be set up and reviewed before fabrication. If that goes well, at least some of the signs will be installed this summer. 4. PAVER CROSSWALKS (2007): 3rd Street crossing (at the Library Plaza) is scheduled to start inearly July. Some dissatisfaction was expressed about the pavers — they are durable but don’t look “authentic.” (The 2008 5th St project currently includes paver crosswalks at Division and Water.) Staff and consultants agreed to to review the idea and the material with the committee before 2008 projects are engineered. 5. BENCHES, PLANTERS AND (?) CORRALS (2007): Staff agreed to order 5 more benches and 5 bike racks. I’m to send the list of those who already have requested them to Joel. Several of us raised the newspaper dispenser corral question. As I anticipated, this is more complex than it may appear, including the need for an ordinance. 6. DOWNTOWN LIGHTING STUDY (2007? ): The committee urged staff and consultants to proceed with this; the current system is wearing out and there are now several styles in the general downtown area. Also see Item 7. 7. 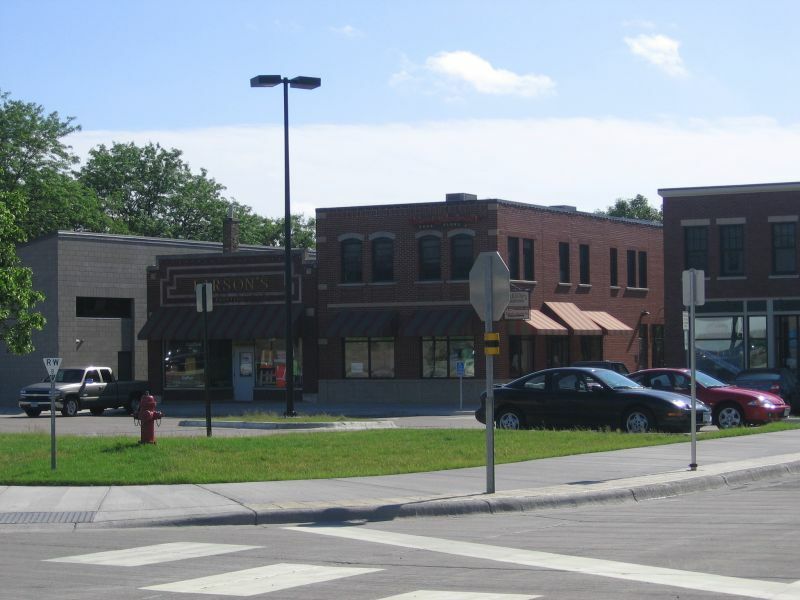 STREETSCAPE ENHANCEMENTS (Design-2007): Some standardized design details and specifications for walks, curbs, street trees, landscaping and lighting need to be worked out and approved before engineering is completed for the 5th Street project. 8. RIVERWALK TRAIL CONNECTION (2007): In conjunction with construction of the pedestrian bridge at the future trailhead behind Walgreen’s, the City plans to extend the trail from Riverside Park along the river bank behind River Park Mall, Just Foods and the corner building to Fifth Street. This hasn’t quite cleared DNR yet, but indications are positive. As a result it may not get done until 2008. 9. RIVERWALK PEDESTRIAN RAMP AT “BYZANTINE SITE” (2007? ): Design and land acquisition are scheduled for a ramp between the existing riverwalk and the SW bridgehead at 2nd Street. 10.MALT-O-MEAL DAM RE-BUILD (Construction-2008): This is a joint project, with Malt-O-Meal redoing the dam and the City redoing the east headwall and railings. A cantilevered observation platform is currently part of this plan.